Beatrice came to our family as a foster in January 2014. She was a senior girl, guessed to be around 11 years old. Beatrice was emaciated when she came to us with horrible teeth, a few lumps, bumps and bruises. We got her back to health and enjoyed watching her blossom from a dog that probably had little to no contact with humans to a food-seeking sweet little girl. It took about three months before her tail wagged and even then you considered yourself lucky if you got a tail wag from her. Nothing bothered her, she was good with all the dogs and good with everyone she met. It was such a comfort to see her scratch her bed every night getting it "just right" and to hear her settle down with a great sigh. Beatrice left us too soon in February 2015 from cancer. She didn't suffer and was happy until the day before she left for the rainbow bridge. 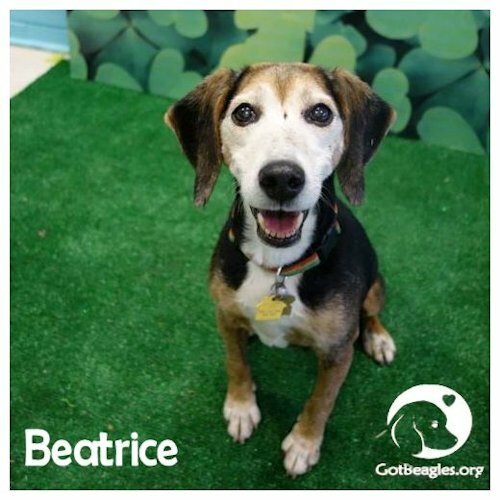 While Beatrice never got her "official" adoptive family, she was very much a part of our family and we considered her one of our own pack.